Located in Eastbourne, East Sussex, Neptune SUPs is the brainchild of Damian Scott. With aims of getting all paddlers on the water in the most efficient way possible Neptune are another home grown company determined to keep the sport accessible and affordable. We hit up Damian for the lowdown on the brand. Tell us about your watery history – how did you get into sports of a moist nature? I could swim before I could walk, but my first real liquid love was surfing, then came windsurfing. I still try to get out but nothing like I did. SUPing also entered my world pretty soon after it landed on UK shores. When did you first come across stand up paddle boarding? Did you think it looked cool? Initially I wasn’t really interested in SUPing as I couldn’t see the appeal – no buzz or excitement (so I thought). Then a mate made me try it and the rest is history. Where did you first learn to SUP? Eastbourne at the Seven Sisters (see article in the latest SUPM mag – ed). Got any fond memories of your time stand up paddling so far – can you share? I’ll never forget the first wave I caught on a SUP. I just could not get over how I could be on such an ankle biter of a wave (more of a large ripple) and still ride it! Who are your SUP heroes? Got to be Laird Hamilton. What about land based activities – anything that gets you frothing like a silky offshore wave? Always loved skateboarding and BMX. Snowboarding is another real passion for me. Where did the idea for a SUP brand come from? After deciding I was going to purchase a SUP I looked online and was shocked how expensive they were. A close mate said: ‘shape your own’. The seed was sown. What appealed about the concept? I loved how easy SUP was/is and just wanted to share that stoke with as many as possible. As a home grown UK company was it difficult getting things off the ground? Defo! From idea to sample board seemed to take forever. Design, shape (an old surfing mate of mine helped here), finding the best factory, creating a website, nailing the branding, finding a shop space, marketing and logistics all take time – the list just goes on and on. Talk us through your day to day responsibilities – is it all paddling, testing, paddling or do you have to do some work occasionally? I’m lucky to own other businesses so I can give Neptune most of my time and energy. Although I seem to be spending less time on the water these days. What’s that all about?! Neptune has come a long way in its short existence – what’s been key to Neptune’s success do you think? We have done that and from feedback I hear we have done a pretty good job. Our customer service is a really big thing with me and I always do my best to help anyone that gets in contact and love that I can do that. In terms of change, how’s the sport moved on in the UK? Is it easier to sell SUP gear nowadays? The sport is definitely growing in the UK; you see it everywhere which really helps. 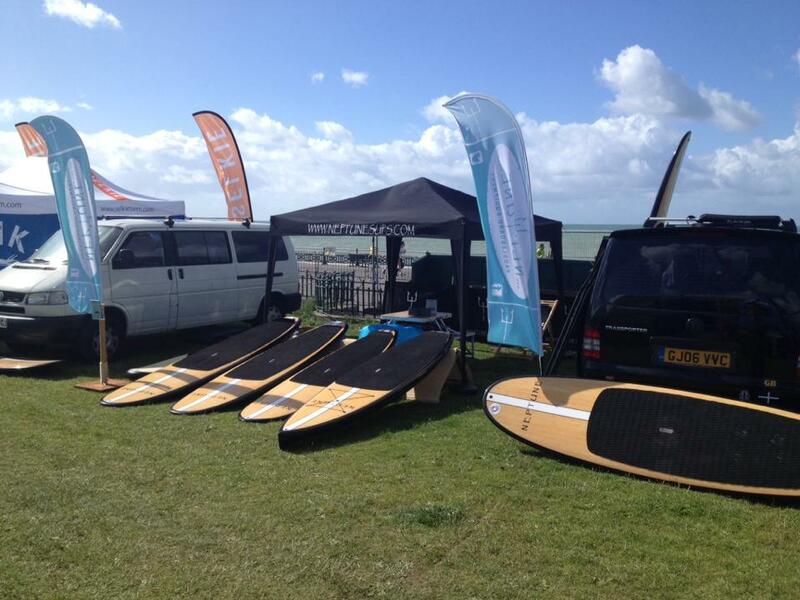 Why do you think inflatables are more popular than hard boards in the UK? Storage! Although I do find that there are growing numbers of paddlers selling their ISUPs and buying hard boards. They end up leaving their blow ups inflated which kind of defeats the object. A realisation suddenly hits that hard shell SUPs aren’t as cumbersome as once thought. Any plans to introduce new shapes to the range? Tell us about how you plan on developing the Neptune brand. What about further plans to evolve, technologically or otherwise? Again we are always looking to grow but keep the same morals that Neptune was founded on. We are looking to expand into Europe and the US but step by step. Finding the right partners is really challenging. They are out there and we will find them. As for kit, there’s normally something we are working on. What’s your most popular piece of equipment? Why do you think that is? Give us your thoughts on SUP kit in general. There is some great kit out there but also some very overpriced gear. If it wasn’t for companies like Neptune entry level would be too expensive in my opinion. The sport’s growth would stall. SUPing is not or ever should be elitist. Talk to us about your personal quiver – what are you using and why? Easy question. I use all the Neptune boards but my 10’ Mach #1 Allrounder is by far a favourite. It’s the original sample board from the factory and it’s gone through the ringer and still looks and handles like a dream. One day it will end up on my wall (but not for many years yet!). Where’s your local spot? What does it offer stand up paddle boarders? The Seven Sisters – see the article in the latest SUPM (Aug 2016 issue). Any plans to hit up locations further afield for personal SUP time – if so where you headed? Always love a trip. Going up to Bodium to get on the Rother in a few weeks, really looking forward to that (Neptune SUPs Summer camp 2016). Describe your dream destination – why does it tick the boxes? Just somewhere warm, with clear water, doable waves and my friends (and cold beer). Is it just waves or are you happy paddling all waters? Just happy to be on the water. Got any burning SUP ambitions outside of your normal routine? Not really. I would just love to be a small side note in the future history books of UK SUPing. Any final thoughts on SUP or Neptune? It doesn’t matter what kit you buy as long as it gets you on the water and you have fun! Too many to list but: Mark H. Chris C, Graham O, Nicola C, Terry J, Rob, big shout to Gazz, my family and finally but most importantly my wife Louise – without her nothing matters.